Why is my blood sugar level higher first thing in the morning ? QUESTION: What can I take to help for the high blood sugars when I wake up?, so that I can have normal blood sugars, I don't want to take medicines because I am allergic to all the medicines my doctor has prescribed for me, shes talking about putting me on Insulin , and I don't want to go on Insulin. Can you recommend an alternative for me, I am 70 years old, my doctor told me if I don't control my high blood sugars I can have a stroke or heart attack, let me say my blood sugars are not high all day it's only in the morning when I get up of course when I go for my fasting blood work it's in the morning and it always high in fact the last one I had done was 2 weeks ago my Hemoglobin A1C was 7.7 and it showed my average blood glucose per day is 174. 1.First, you say you are 70 years old. Keep in mind that the more years you have, the more difficult it would be for your body to keep the normal balances (sugar also). foods, steamed, grilled or baked (avoid frying or fatty foods). You should talk to any dietitian, who can help you draw up your daily menu with calories calculated according to your body needs as I can only give general advices since I do not have more details. 3. Your lifestyle) can also contribute to high blood sugar levels as you are 70 and your daily movements might be limited due to physiological factors. exercises according to your body needs. Your doctor can advise better on the exercises most suitable for you (as I cannot give exact instructions). a. your dinner was overloaded with high calories foods (especially high carb). Since your body insulin is not working properly or pancreas has difficulties in correct production or/and secretion (which is explained with your high blood sugar levels); therefore, it won't be possible for your body to lower blood sugar by its own. Therefore, you must help your body by avoiding the intake of high caloric foods before bed. It is more advisable if you take some vegetable soups at least 4 hours before going to bed (please keep this in mind). In this way, you will give your body the necessary time to handle the calories in the food before going to bed. b. Another explanation includes the "morning hormones" that makes your blood sugar goes high as it is the fuel that your body needs to start the day. 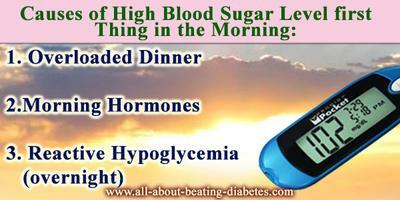 However, in your case, these "morning hormones" are causing high blood sugar levels. If you follow the diet and lifestyle changes, you can overcome this problem too. 4. There are certain herbs that can help lowering fasting blood sugar levels, such as cinnamon, bitter melon, gymnema sylvestre, fenugreek, etc. You can implement them in your daily menu or take the appropriate supplements according to your age. diabetes complications such as diabetic neuropathy.